Pharmaceutical executives were in the hot seat on Capitol Hill on Tuesday, facing questions from the Senate Finance Committee about the rising cost of prescription drugs. “There is no question that researchers and doctors have developed treatments and cures for disease where there was no such cures or treatments. Such innovations take time and money...but we’re all trying to understand the sticker shock that many drugs generate,” said Finance Committee Chairman Chuck Grassley. 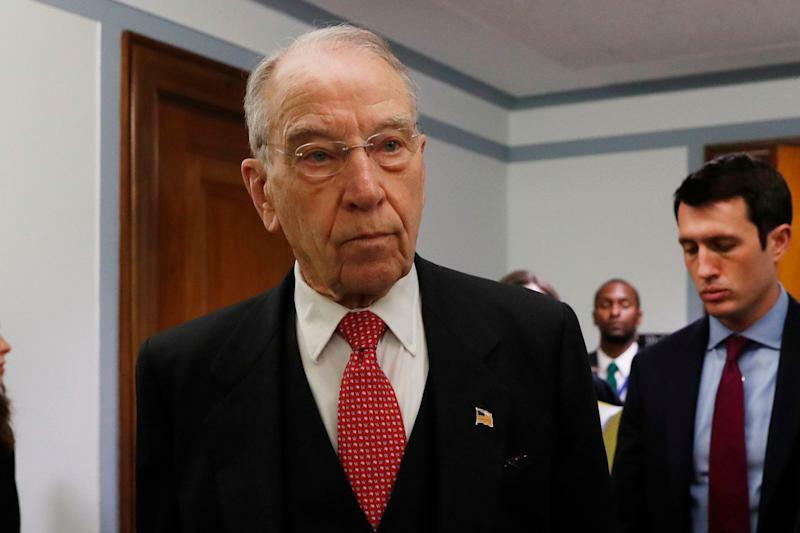 Before executives had the chance to blame other players in the industry, like pharmacy benefit managers or insurance companies, Grassley said he was “sick and tired” of the blame game. Ranking member Ron Wyden (D-OR) blamed pharmaceutical companies for “astronomically high” drug prices. He said it’s “morally repugnant” that patients may be forced to skip doses because they cannot afford their medication. “Pharma executives – all of you here today – are here because the way you do business is unacceptable and unsustainable,” said Wyden in his opening remarks. The chief executive officers of AbbVie, AstraZeneca, Bristol-Myers Squibb, Merck, Pfizer and Sanofi are testifying before the committee. Johnson & Johnson sent the head of its pharmaceutical unit. Most of the executives acknowledged there is a problem with the cost of medications, but they often pointed to the need for systemic change rather than specific changes their companies could make. The executives presented some ideas to lower prices, including reforming the rebate system, moving toward a value-based pricing and capping senior spending. “New breakthroughs are coming quickly to treat many difficult and devastating diseases. But these breakthroughs won’t do anyone any good if patients can’t afford them. And unfortunately, the horribly misaligned incentives within our health care system often make medicines unaffordable for American patients. We need to fix this,” said Pfizer CEO Albert Bourla in his prepared remarks. “We recognize that patients’ out-of-pocket costs continue to increase. We believe it is possible to work together to realign incentives to ensure patients can afford medicines without stifling scientific innovation,” said Bristol-Myers Squibb CEO Giovanni Caforio. After the executives talked about their companies investments in research and development, Sen. Debbie Stabenow (D-MI) highlighted the federal grants drugmakers receive for research. “I’m glad we’re talking about research. I’d like to step back for a moment and talk about who basically is funding research -- I hope you’ll say thank you to the American taxpayer,” said Stabenow. Senators grilled the executives on a range of issues, including why American consumers pay more for drugs than consumers overseas. “I think that you charge more here [in the United States] because you can,” said Stabenow. Sen. Stabenow and Sen. John Cornyn (R-TX) both focused on AbbVie and the patents it has on Humira. AbbVie has more than 130 patents on the drug, some of which expire in 2034. Some critics argue brand-name pharmaceutical companies use patents to block generic competition. “No, it’s not,” said AbbVie CEO Richard Gonzalez. Gonzalez told Cornyn and Stabenow that as researchers have discovered more uses for Humira, it has received more patents. “The patents that are covered in this portfolio are for individual innovations that were created,” said Gonzalez. Cornyn called on the Senate Judiciary Committee to examine the patent system. Grassley said he would support the idea. In a Des Moines Register op-ed after the hearing, Grassley said the executives should stop “grandstanding” and work to lower prices. “Despite hours of preparation and high-priced advice from K Street consultants, I had hoped they would come genuinely prepared to offer substantive solutions and not just shift the blame. At times, I was disappointed. This hearing was their opportunity to shoulder some accountability and share solutions,” Grassley said. There is a bipartisan effort in Congress to rein in the cost of prescription drugs. Together, Grassley and Sen. Amy Klobuchar (D-MN) have introduced bills aimed at lowering the cost of drugs. The senators want to limit “pay-for-delay deals,” in which brand-name companies pay generic companies to delay releasing competing generic drugs. Another bill would allow consumers to personally import cheaper prescription drugs from Canada. Americans spend more on prescription drugs than anyone else: according to the Organisation for Economic Co-operation and Development, average costs are about $1,200 per person per year. Prescription drugs accounted for 17% of total U.S. health care spending — or about $457 billion — in 2015. That share is expected to rise over the next decade as drug costs outpace those of all other health care services, according to the Commonwealth Foundation.